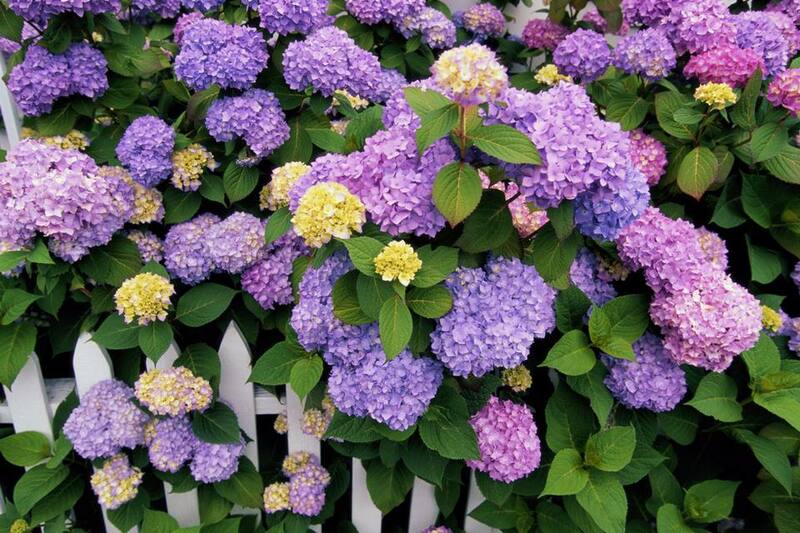 Hydrangeas have been popular garden plants for decades. Older varieties add sentimental charm and new hydrangea shrubs can bloom from mid-summer through fall. Hydrangea flowers now come in an even wider variety of colors, including bright blue, deep red, and pale green. These versatile shrubs will thrive in both sandy coastal soils and in shady woodland sites and almost everything in-between. The most commonly grown hydrangeas used to be the bigleaf hydrangeas (Hydrangea macrophylla) and mountain hydrangeas (Hydrangea serrata). Both are deciduous shrubs, native to seacoasts and mountain valleys in Japan. They are categorized by the shape of their flowers. Mopheads (sometimes called hortensias) have large, round flower clusters. In contrast, the lacecaps bloom in flat, delicate clusters. The choices among hydrangea species, hybrids, and cultivated varieties expands every year, which can make it very difficult to choose just one. Besides color and size, there are literally hundreds of mopheads, climbers, lacecaps, and oakleafs, to name just a few? Too much food or water can sometimes the cause of the lack of flowers. If hydrangeas are given too much high-nitrogen fertilizer, they may grow full and lush, but there will be fewer flowers. Regular water is also important for healthy plants. Hydrangeas benefit from 1 inch of water a week during summer (unless it rains). Bigleaf hydrangeas in full sun may need up to 2 inches during the hottest summer days. In areas with bitterly cold winters, dieback can be a problem. Protect your hydrangeas from cold winds by planting them in a sheltered spot or with a burlap windscreen or a burlap frame filled with dry leaves. It may sound counter-intuitive, but a North or east facing site, where temperatures remain somewhat constant is a better choice than a spot on the south and west side of your property, which will heat up in the winter sun and may cause hydrangea buds to open prematurely, leaving them vulnerable to cold snaps. However, the biggest cause of a lack of flowers is incorrect pruning. Bigleaf hydrangeas flower on old wood, which means branches that developed in prior years. If you prune in the spring, you could be pruning off that year's flower buds. The best time to prune bigleaf hydrangeas is immediately after flowering. Hydrangeas tend to need minimal pruning, but if you would like to reduce the size of the plant or prevent it from flopping over too much after the flowers fade you can remove some of the older canes, which will reduce crowding and encourage new growth. The exception to this rule is when cold winters kill the tips of the branches. Then you should prune in the spring, removing the deadwood and cutting the stems back to a healthy set of buds. If you have an established shrub, you can also take out several of the older stems at this time. Just don't remove all the buds; otherwise, you will lose your blooms. If caring for old-fashioned hydrangeas sounds too complicated, there is still a hydrangea for you. New cultivars have been introduced in recent years that flower on both old (last season’s) and new (this season’s) stems. These are sometimes referred to as ever-blooming hydrangeas because they flower almost continuously throughout the season. These ever-blooming cultivars include Hydrangea macrophylla "All Summer Beauty", "David Ramsey", "Decatur Blue", Endless Summer®, Mini Penny™, "Oak Hill", and "Penny Mac" Hydrangea serrata "Blue Deckle", and "Coerulea Lace". New varieties debut every year and they get better and better. Although not quite as continuously blooming as the ever-bloomers, there are some vigorous old and new cultivars that flower over a very long season. These are sometimes called free-flowering hydrangeas. It's a subtle distinction, but one you should be aware of when shopping for hydrangeas. The free-flowering hydrangeas include Hydrangea macrophylla "Altona", "Ami Pasquier", "Europa", "Forever Pink", "Frillibet", "General Vicomtesse de Vibraye", "Lilacina", "Lanarth White", "Madame Emile Mouillere", "Mousseline", "Nikko Blue", and Hydrangea serrata "Fuji Waterfall". Mountain hydrangea (Hydrangea serrata) will also flower over a long period. Although sometimes difficult to find, good cultivars of these include "Beni-gaku", "Geisha Girl", "Kiyosumisawa", "Miranda", "Miyama-yae-murasaki", "Tiara", "Woodlander", and "Yae-no-amacha". One of the perks of growing bigleaf hydrangeas is being able to change their color. Although somewhat determined by cultivar, you can play with their color by changing the amount of aluminum in the soil and the soil pH. The soil pH will determine how available aluminum is to the plant. Acidic soil will give you blue flowers (aluminum available to the plants), and alkaline soil will give you pink flowers (aluminum unavailable to the plants). To decrease the acidity of your soil (to change flowers from blue to pink), add hydrated lime to your soil in the spring. To increase the acidity of the soil (to change flowers from pink to blue), add aluminum sulfate to your soil in the spring or mulch with oak-leaf mulch. In addition to the popular bigleaf and mountain hydrangeas, there is a wonderful selection of other species to choose from. The oak-leaf hydrangea (Hydrangea quercifolia) has become extremely popular in East coast gardens. Hardy down to USDA zone 4, this beautiful south-eastern North American native has ornate peeling bark, large-flowering panicles that age well, and intense red fall color. Oak-leaf hydrangea flowers on old wood and should be pruned immediately after flowering. It is a low-maintenance shrub that needs little pruning; simply remove dead wood and cut back a few stems every few years to maintain a full plant. Oak-leaf hydrangea thrives in partial shade but can tolerate quite a bit of sun. Some cultivars to look for are "Alice", "Amethyst","Pee Wee", "Snow Flake", and "Snow Queen". Another great hydrangea is the smooth hydrangea (Hydrangea arborescens). Also an East coast native, this hydrangea does best in partial shade to full sun. This is a large shrub, growing from 4 to 6 feet tall and up to 6 feet wide. Smooth hydrangeas flower on new wood. You can treat them just like a perennial and cut them back (either to the ground or back to 1 – 2 feet) in the fall, or you can leave them for wonderful winter interest and cut them back in the spring. They are almost impossible to kill. Some popular varieties are "Annabelle", "Grandiflora", and White Dome™. Panicle hydrangeas (Hydrangea paniculata) make a big statement in the home garden. They can be grown as a shrub or a small tree. Panicle hydrangeas flower on new wood and can be pruned in the spring according to the desired form. If you choose, you can keep them small by cutting them back to 1 – 3 feet, but they really want to be large shrubs. To grow one as a small tree or a standard, prune the crown of the tree to 3 – 5 main branches. As with all hydrangeas, remove any weak or dead branches. Panicle hydrangeas tend to flower later in the season than other species, but the show is magnificent. The large-flower panicles can range from white to pale pink to lime green. Cultivars include: "Burgundy Lace", "Chantilly Lace", "Grandiflora", "Limelight", "Little Lamb", "Pee Wee", and the late-flowering "Tardiva".